So…. Coodles? Is that what we’re calling cucumber noodles? I made parsnip noodles once, so I guess those are poodles? I’m just trying to figure out why zucchini noodles get their own name and nothing else does. 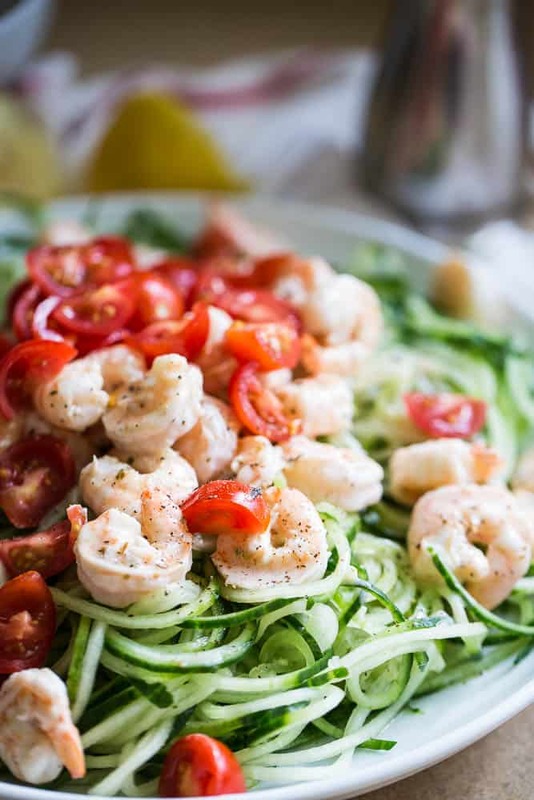 Have you tried a spiralized cucumber? Cucumbers were cool and refreshing before, but man… I love them in noodle-form. Then you can spiralize ALL THE THINGS. 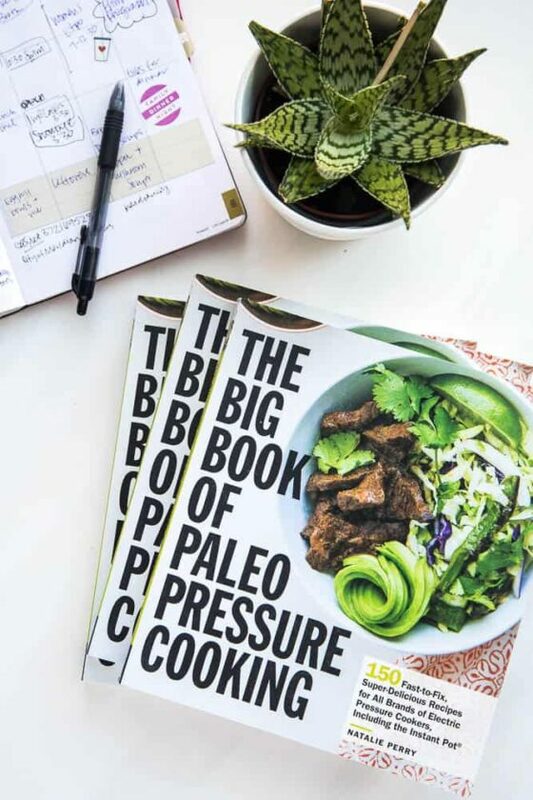 And make Pesto Zoodles with Broccoli & Bacon, Sesame Marinate Cucumber Noodles, some butternut noodles to put under Easy Italian Sausage Meatballs. Also, sweet potato noodles are pretty amazing baked in the oven. (Think: sweet potato curly fries.) But, let’s save that for when it’s not 2000 degrees outside. Ok, so this recipe is a perfect weeknight dinner recipe when it’s smoking hot. It’s quick. It’s easy. It’s light. It’s healthy. It’s perfect, really. 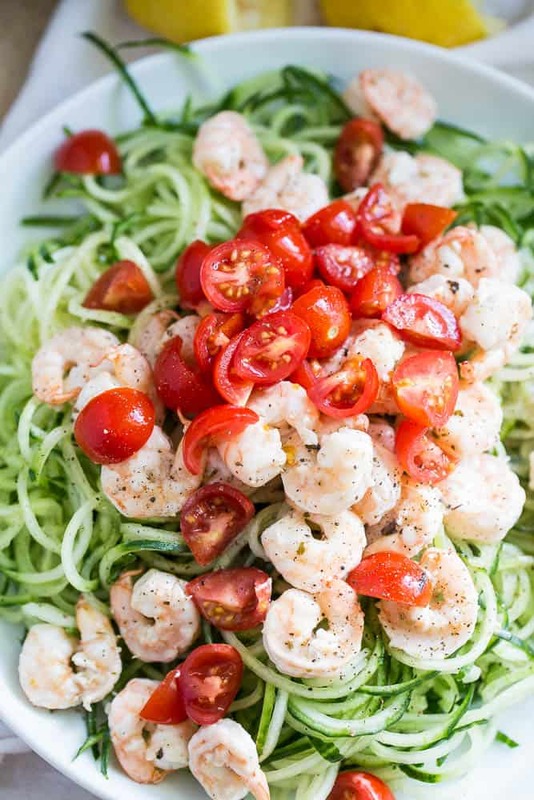 Just marinate some shrimp and toss it into a hot skillet for a few minutes, then pour it, and the creamy, Greek-y sauce over a big bed of cucumber noodles. Want to know a secret? The “creamy” comes from coconut cream. I promise it doesn’t taste all coconutty. There’s so much going on with that Greek seasoning that you won’t noticed it. And throw some tomatoes over the top because it’s pretty. You’ve probably got those coming out of your ears, too, I’m guessing? 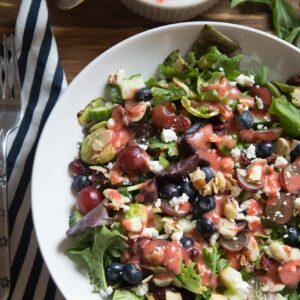 You’ll love that Homemade Greek Seasoning, too. Make a big batch and then whip up some One-Pan Greek-Marinated Chicken & Potatoes when you’re ready to turn your oven back on. 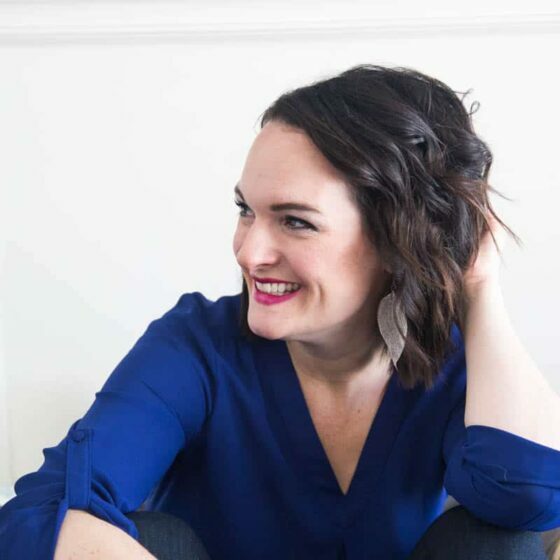 Bonus: this recipe is also Whole30 compliant! This light, summery dish is the PERFECT thing to make on a busy weeknight. 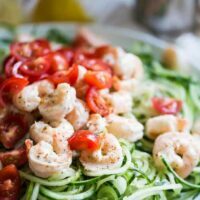 The shrimp cooks up in no time and the spiralized cucumber is tossed in a creamy, garlicky Greek dressing. This will be come part of your rotation, promise. 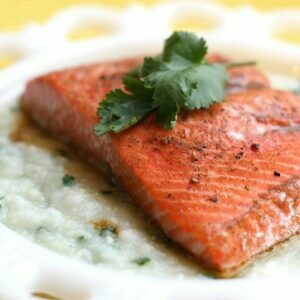 Combine the lemon juice, Greek seasoning, and 1/4 cup of avocado oil in a small bowl. Place the shrimp in a shallow dish or a zip-top bag. Pour half of the marinade over the shrimp. Marinate for at least an hour, or up to 3 hours. 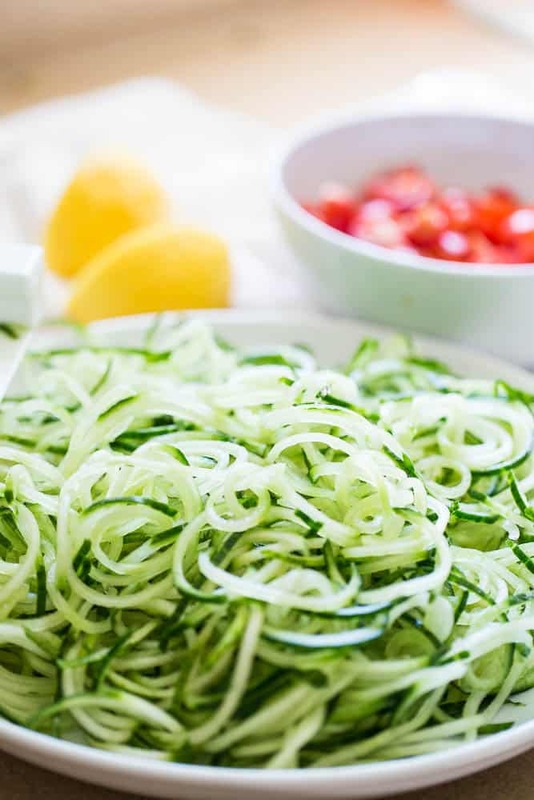 When you're ready to cook, spiralize the cucumber noodles and place them on a large serving platter. Put the remaining 2 Tablespoon of avocado oil in a large skillet. Heat over high heat, then add the shrimp to the skillet, discarding the marinade. Cook for 3-4 minutes until all of the shrimp is just barely pink and cooked through. Transfer the shrimp to a plate. 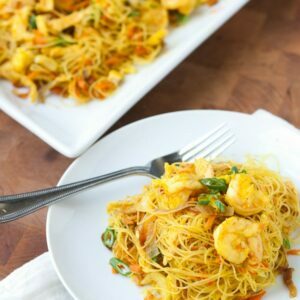 While the pan is still hot, add the coconut cream to the skillet, and stir, scraping up any bits and creating a creamy sauce. Turn the heat off, then add the shrimp back into the skillet and toss with the sauce. Pour the reserved marinade over the cucumber noodles and toss to coat. Transfer the shrimp and creamy pan sauce to the noodles. Add the chopped tomatoes to the top and serve. 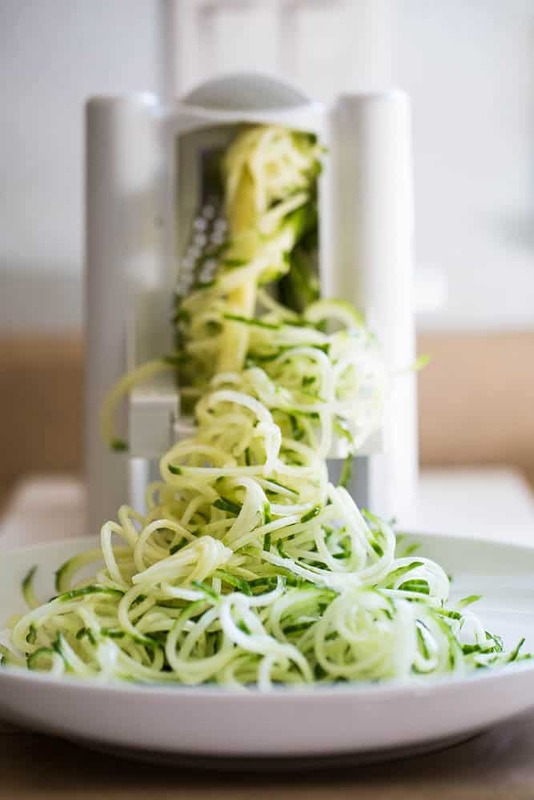 If you don't have a spiralizer, you can slice the cucumbers really thinly with a mandoline or a sharp knife.